Quality Hooch raises $60,000 for water monitoring efforts since 2016! The Quality Hooch Campaign moves on to year four of ensuring a forever clean and sustainable Chattahoochee River. Help us raise $50,000 for Chattahoochee Riverkeeper as they celebrate 25 years of keeping watch over our waters. How It All Started. 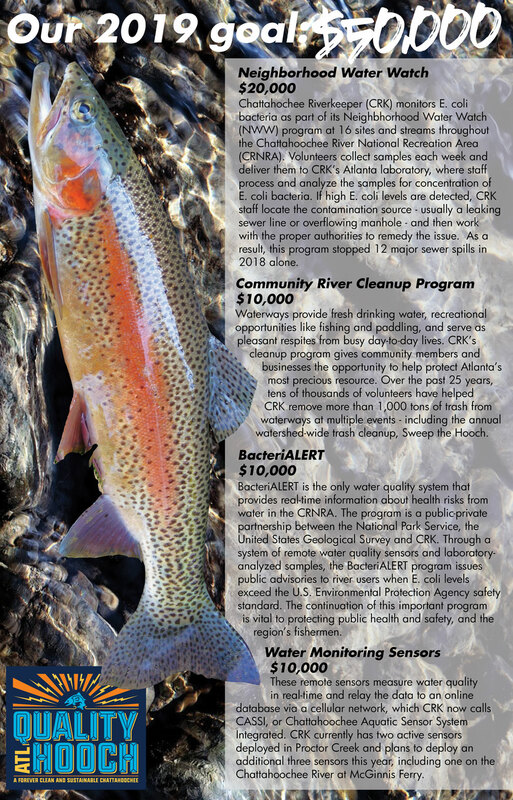 In 2016, The Orvis Company partnered with Chattahoochee Riverkeeper (CRK) to solve a major problem – the high price of efficient, effective, remote water quality monitoring. Ensuring our water stays healthy for all takes diligence on the part of CRK’s water watchers, and an effective sensor would mean they can continue to keep watch over our waters for years to come. Through a partnership with communications company Ericsson and their Technology for Good Program, the partners took on the task to design low-cost remote water quality sensors that would cost only $200 per unit. Funds generated by the first ever Orvis Quality Hooch Campaign helped produce the initial prototypes of this sensor design, under the leadership of Ericson engineers. While Ericson eventually came to drop the project due to a change in leadership within their company, CRK all the while pursued a network of other new low-cost water quality sensors with support from The Orvis Company. In addition, the organization sought partnerships that would continue the design created under the original Quality Hooch Campaign, including Environmental Protection Agency Region 4 and the Stroud Environmental Research Center. CRK’s work over the past two years has led to a new-and-improved design. This model utilizes a sensor designed by Stroud that they have incorporated within the Ericsson housing bodies. These complete water quality sensors are now ready for deployment at a base cost of $500 per unit (although the cost may be higher if additional parameters are necessary for a site). While this is higher than the initial goal of $200 per unit, it’s still much lower than traditional technology in this field, which costs upwards of $12,000 per unit. A Forever Clean and Sustainable Chattahoochee. Orvis is proud to continue our partnership with Chattahoochee Riverkeeper in 2019, celebrating year four of the Quality Hooch Campaign and the organization’s 25th anniversary. This year’s campaign will support CRK’s Chattahoochee River National Recreation Area (CRNRA) River Protection Program, which focuses on their work in the federally protected 48-mile stretch of the river – home to the southeast's premier trout fishery. Thank you to all of our Orvis customers who continue to contribute to our conservation efforts. Together we are achieving great things for our waterways! Join us on April 13 and 14, for the 4rd Annual Quality Hooch kick-off party in celebration of Orvis Spring Days! The event will be held Saturday from 11 to 4 PM at Orvis Atlanta and on Sunday from 12-4 at Orvis Alpharetta. The kickoff will include food, SweetWater beer, celebrity guest speakers, and some great deals on apparel, and on Sunday from 12 to 4 at Orvis Alpharetta. Stay tuned for more details. This year, all Orvis FF101, 201, and 301 students will receive a one-year membership to CRK. Visit Atlanta or Alpharetta to view our calendar and register for a class. The 6th Annual Orvis Down the Hatch Film Festival will return on Sunday, September 29 at The Metropolitan Club in Alpharetta, GA. This year’s event will be family friendly, and celebrate the next generation of fly anglers and conservationists. Visit the event page for more details.